**All IIT Mock Tests are of Excellent quality. This JEE Main test series is free of cost but that doesn’t mean it is not at par with IIT-JEE Standards. **Please like and share to support us. However ours is a free IIT-JEE Test Series for 2019. This free JEE Test Series 2018 (for JEE Main and Advanced) consists of 10 tests before JEE Main 2019. Rest of the free tests on JEE Advanced Pattern will be added in the month of April. 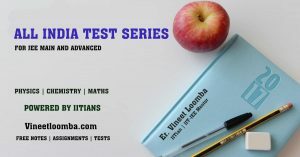 This Test series has been prepared by IITians and is at par with JEE Standards. So practice these tests very seriously. Each Test consists of 90 Questions. This is not a typical JEE Main pattern but these tests are aimed at preparing you for JEE Main and Advanced both. Hence such pattern has been kept. Time management is an important factor in JEE Main. So, while solving these JEE MOCK question papers, keep an eye on your watch too. If solving a question is taking too much time, move on ! AITS-10 will be available soon. Physics : Mathematical Tools (Graphs & Vectors). Physics and Measurement, Kinematics, Laws of Motion. Chemistry : Some basic concepts of Chemistry, States of Matter (Gaseous & Liquid). Atomic Structure, Classification of Elements and Periodicity in Properties. Chemical Bonding and Molecular Structure. Mathematics : Sets, Relations, Functions. Trigonometric ratios and Identities, Trigonometric Equations. Inverse Trigonometric Functions, Heights and Distances. Physics : Work, Energy and Power, Rotational Motion, Gravitation, Properties of Solids and Liquids. Chemistry : Thermodynamics, Chemical Equilibrium, Redox Reactions; Hydrogen, s-Block Elements, Some p-Block Elements (Group -13 & 14). Mathematics : Complex Numbers, Quadratic Equations, Mathematical Induction; Permutations and Combinations, Binomial Theorem & its Applications. Physics : Kinetic Theory of gases and Thermodynamics, Oscillations, Waves. Chemistry : Purification and Characterization of Organic Compounds, Some Basic Principles of Organic Compounds, Hydrocarbons, Environmental Chemistry. Mathematics : Sequence and Series; Cartesian Co-ordinates, Straight Lines, Pair of Straight Lines, Circle and Family of Circles, Conic Sections. Syllabus of AITS-1 , AITS-2 and AITS-3. Physics : Electrostatics and Current Electricity. Chemistry : Solid State, Solutions, Chemical Kinetics, Electrochemistry; Surface Chemistry. Mathematics : Determinants and Matrices, Vector Algebra, Three Dimensional Geometry, Mathematical Reasoning, Statistics, Probability (XI & XII). Physics : Magnetic Effect of Current, Magnetism. Electromagnetic Induction, Alternating Current, Electromagnetic Waves. Chemistry : General Principles & Processes of Isolation of Metals. p-block Elements (Group 15 to 18),d & f-Block Elements. Coordination Compounds, Organic Compounds Containing Halogens. Mathematics : Limits, Continuity & Differentiability, Application of Derivatives. Physics : Ray Optics and Optical Instruments. Wave optics, Dual Nature of Matter and Radiation, Atoms and Nuclei. Electronic Devices, Communication System and Experimental Physics. Chemistry : Organic Compounds Containing Oxygen and Nitrogen. Polymers, Biomolecules, Chemistry in Everyday life, Principles related to Practical Chemistry. Mathematics : Indefinite Integrals, Definite Integrals and their Applications, Differential Equations. Syllabus of AITS-5, AITS-6 and AITS-7. Complete Syllabus of Class XI & XII for JEE Main. Test Schedule for JEE Advanced 2018 will be uploaded at a later date. “Practice makes a man perfect” – is a very old saying that is valid in any field of life. This applies to your JEE Main preparation also. The only way you can work your way through to a top rank in the JEE Main or Advanced exam is through a lot of practice. But, note that practicing blindly won’t cut it. You have to practice those problems which test your concepts in a challenging way. Practicing daily is very important for your entire JEE Preparation. You can use our free assignments to solve unlimited questions of varied difficulty levels and sharpen your skills. You should also practice our All India Test Series to test yourself in a time bound manner. It will help you find out where you stand in reality – what all topics you are weak in and where you need to work harder. Press the G+1 button and Fb like button to support this website. Don’t forget to Bookmark our Website here. Stay updated by connecting with us on our Facebook Page here Vineet Loomba. Sir if I give the test so how should I compare myself as to where I am ! And how much more preparation is required ! What would be a good score in the test uploaded by you ! And thank you very much sir for helping us with this ! I am parent of jee aspirant 2019. I very glad to see your free work. Please guide how can I ask my son’s queries/where I need to upload the queries..
Who gives asertion and reason in jee mains paper. And who the hell gives comprehension in jee mains paper. Worst AITS series ever. if you would have read the post patiently you would have seen that this series is for JEE Main as well as Advanced also. I have clearly mentioned that the pattern is different from JEE Main exam. If you cant appreciate the effort, atleast dont try to demotivate me with such comments. Thanks. Sir can you provide us some notes and assignments for KVPY, 2018 . Also sir, you are doing a great job . We are lucky to have you. Sir can you provide us some notes and assignments for KVPY, 2018 .
at the time of filling of form anybody miss guide me about age limit he tell me you can not eligible ,above 18 is only are eligible. please tell can we now apply now for it . i am sorry but it is not possible to fill form at this stage as last date has passed..you will have to try next year or take admission in colleges which accept without jee main score. Will you plz send it ASAP. great efforts sir. I salute you. Whether physics chemistry or maths i get confused. yes tell me how can I help ? Thanks Sir. You are really doing a great job. Sir please provide us some good inorganic chemistry notes for jee mains and advanced. As it needs lot of learning so we will not be able to learn due to stressed conditions near the exam timings. So sir please provide soon. can you specify the author and publication ? I have full Etoos video lectures of following faculty. I will give free of cost. Reply which ever you want. Reply in comment which ever you want. where should i get downloads. Hello Sir, I am Currently Studying in class 11th, Can I give the test. Great Effort Vineet Sir ! !